Merry Sole | "Thy word is a lamp unto my feet…"
"Thy word is a lamp unto my feet…"
If it’s a case where people can’t ship out, unless there’s mutiny or a civil change in captain, then everybody is going down. And that is the saddest thought of all. Leaders are always held accountable, no matter the circumstance, even if they might not be directly at fault for the situation. Even the most charismatic leader comes under scrutiny by his followers when things aren’t going their way. But God gives courage in those trying situations to the leader. Courage gives a person just enough “oomph” to take action. The greatest act of faith is to have a plan. We all know we should do it – yet the task of mapping out the direction we want to take in life can seem so daunting. Still, the way how quickly time flies these days, it’s mandatory to have a plan, personal, business or otherwise, if not the years can fly by and then we wonder what we’ve really done over the last five years. I can scarcely imagine that it’s almost 10 years that I’ve been teaching. Ten years!! One thing that has really got my attention now is money. Specifically, how I can improve my financial situation – less debt, more savings, more investments, more peace of mind. I’ve got nearly 100 pins on Pinterest that take me to these great sites with loads of financial advice. But I still haven’t put into action all the advice I read. To be honest, the road to financial freedom seems so scary at times, with all the sacrificing and discipline that will be necessary. But the thought of financial security is so blissful, it makes everything seem worthwhile to achieve it. I just need some help getting on the road and staying on it! As if I was going to forget Merry Sole’s birthday! It seems like I barely made it, given that I’ve been MIA for the last few months. But I did, and it’s worth celebrating no matter how I got here. Is Merry Sole exactly where I want it to be? Not even close. While my plans on number of posts I’d have written, the number of followers I would have had, and the design of the blog have not reached fruition, I’m so happy to say that despite the distractions and subsequent neglect, that I technically still have a blog. Now, I didn’t plan to write this part. Honest. But writing the first few lines instantly set off something in my mind. It’s a timely reminder that, personally, I’m not where I would have wanted to be in life by now, but a hopeful, positive attitude goes a loooong way. If I take stock of all that has transpired up to this point, there is still much for which to be thankful. Plus, once I don’t lose sight of the goal, I can still enjoy the process of reaching it! One voice can become many. I should start by giving a disclaimer. I don’t claim to be completely “woke.” In fact, I’m probably far from woke. I’m trying to get woke, hence the title. I simply want other people like myself to try, simply attempt to get woke with me. I am as white as it gets. Nearly 100% European ancestry, mostly English. I grew up in a mostly white suburb and live in a mostly white town. I’m soon moving to a town that’s probably whiter than the one I live in now. I’m WHITE. I haven’t shielded myself from cultures different my own, but I haven’t exactly immersed myself in them. They say that you learn something new everyday. That was certainly true last Friday, when I learned, or so I thought, that “trailblaze” is technically incorrect. I went on a walk a few days ago with two friends, Davison and Orien, from work. Every other Friday, we leave school to go on trails, taking in the great scenery of the east coast of Barbados. 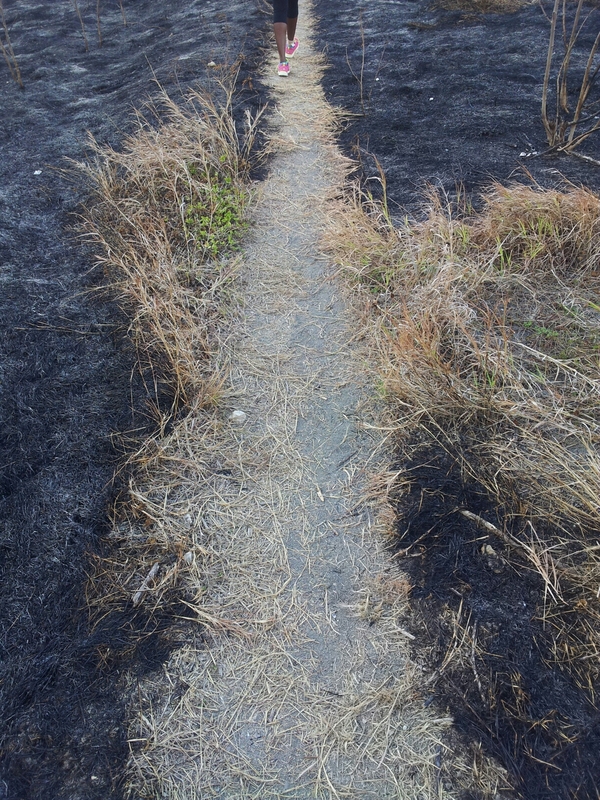 Part of the trail took us through a field that recently had a fire. Davison made an observation that really struck a chord with me.